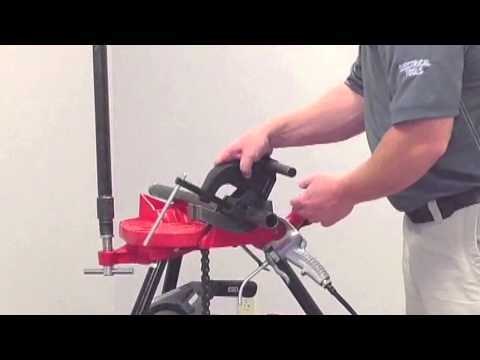 Featuring the RIDGID® die head quick release system. RIDGID die head retaining system is a simple twist and release for the 1 1/2", 2" Die Heads and Die Head Adapter. Lightweight and portable for maintenance, repair and service plumbers. Screw-in brush covers improve serviceability. Durable die cast gear housing and fiberglass reinforced plastic body to withstand demanding job site conditions. Capacity 1/8" - 2" (3mm - 50mm) 11 R Die Heads. Weight 21.1 lbs. ( 9.59 kg) Power Drive only. Size 24.1 in. (613 mm) L x 4.75 in. (121 mm) W x 8 in. (203mm) L.
Controls Forward/reverse slide switch, on/off two-step momentary contact. Gear Head: Die cast aluminum permanently greased. 690-I Hand-Held Power Drive is rated 3.8 out of 5 by 4. Rated 1 out of 5 by emmech from Lousy die Purchased and needed to run a 2” iron pipe gas line, 2” die was defective. Spent time on the phone with Ridgid, supply house we purchased it thru came to job site to assist...after much wasted time, money, and material, Ridgid tech support agreed die was defective. Was completely embarrassed by performance of this tool in front on the customer. So here we are now behind on the job schedule since we have no die for this machine while replacement is being shipped. I will go out of my way to make sure my company never purchases a Ridgid tool again. The only good experience was the support and concern my company got from the supplier. Rated 5 out of 5 by MVpAce from Very very versatile as long as you can clamp it. This unit has carried us forward and allowed us to complete many small piping jobs. The biggest challenge is manually running our hand pump oiler and getting the oil to flow fast enough. The oiler tube became work hardened and we put up with it for some time until the hook was broken, we purchased a new oiler pump and tube assembly which works great and is much easier to manage with a flexible tube. Minor issues with cutting heads which we relate to the oiling challenge. We've been able to win some great jobs having this unit.